In order to carry out the mandrel type pipe bending, the combination of the die assembly must be applied as shown in the above illustration. In that sequence, each piece has a separate significance. Below, you can find the task of each piece of equipment during bending. When the pipe diameter, radius, wall thickness, tube material strain changes, the requirements of the materials for the die assembly will also change. You will find information and examples on our site, not only about the type of mandrel pipe bending system, but also about bending systems applied in many different ways. Unfortunately to reach the technical knowledge and training is not easy in our country. So, we want to share our experience and knowledge of years. Anyone dealing with the issue can find enough information on our site. We believe that knowledge is a treasure increases by sharing. Die is a piece that wrap the tube during bending. Usually it is connected on the table through the wedge. In this way, the beginning position can fix on the bending axis. Thus we can calculate the angle formed between the starting and ending processes. 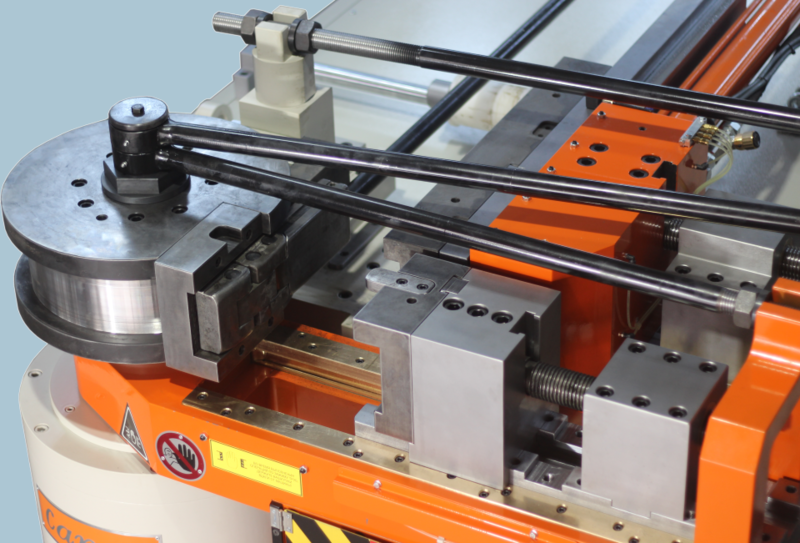 Clamp die prevents independent movement of the pipe during the bending process. It begins to return with the mold so that the pipe can wound to the mold. It works like a clamp. In some cases some teeth can be applied to the interior of the clamp die. These teeth prevent the potential slipping of the pipe during bending. However, this process can create a number of tracks on the outer surface of the pipe. Unfortunately, this is inevitable. Pressure die is a part based on the pipe during the bending and move with the tube. It meets the reaction force produced by the pipe-bending power. It prevents the deterioration of the outer form of the tube by gripping the pipe during bending. At the same time, it helps to facilitate the flow occuring during the bending. 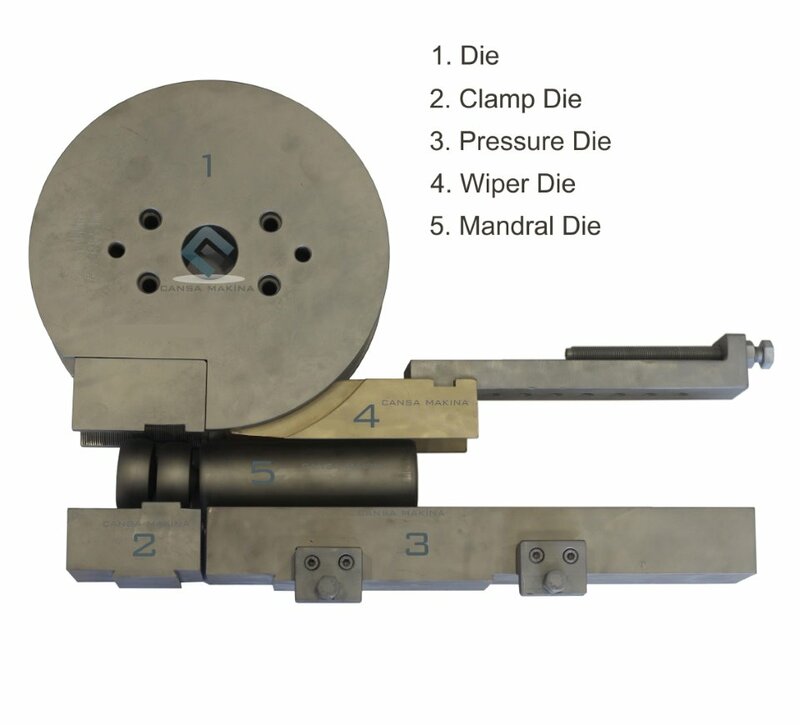 Wiper die is an equipment prevents deformation of the pipe by plastering inner radius during the bending. It is often used in larger diameter than the pipe diameter Ø32mm. For the pipes with narrow radius and thin wall thickness to use wiper die is required. Mandrel is a mold equipment that remain into pipe and at the center of the bending process and plaster the outer radius. So that it prevents the spread of the pipe during bending. Mandrel types may vary according to different wall thickness, radius and pipe diameter.